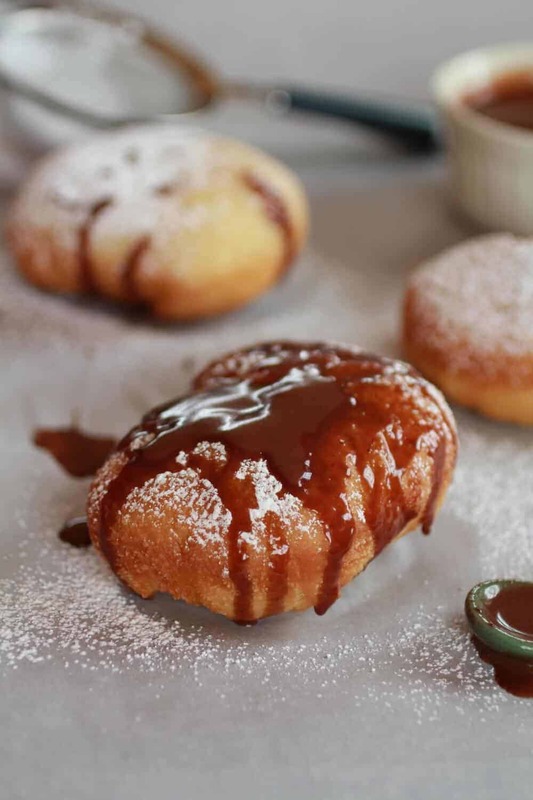 It is Friday, I have homemade chocolate filled beignets with chocolate hazelnut dipping sauce and it is someone’s birthday! Not just anyone’s birthday. Nope, it is my mom’s. Yeah, the women with a crazy chocolate addiction and a crazy desire to have not one, not two, not three, but seven kids. Yes, seven. Then she goes and invites all these weird strays in, like all the time. She can’t help it. She has a heart of gold. As my dad say “that Jenny she is just so nice”. Seriously, though my mom is pretty much the most amazing person. I do not know what we would do without her. She has inspired many (many, many) of my sweet treats. 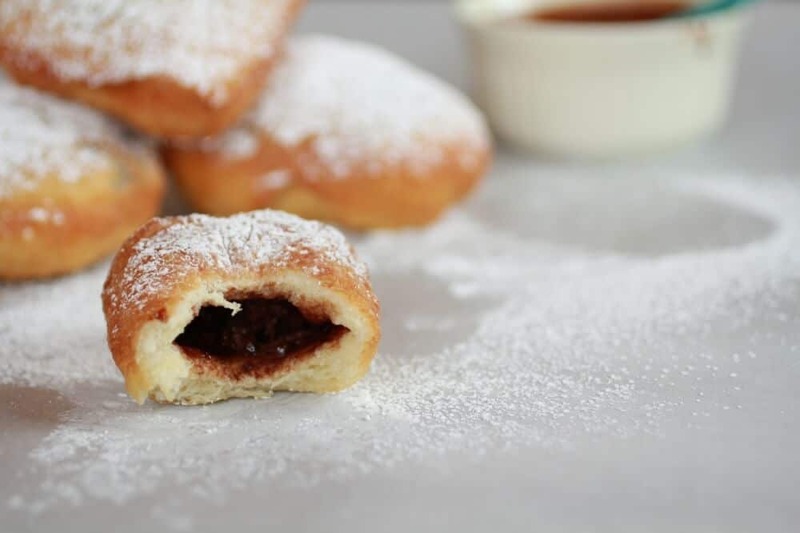 And these chocolate beignets are no exception. What feels like just yesterday, mom and I were shopping at an outdoor mall, Crocker Park in Westlake, Ohio. This was a rare occasion where it was just mom and I. This was before Asher was born and I was still her only little girl, the rest being boys. I can’t remember exactly why we were there, but I remember one thing for sure. The Beignets. I have no idea what made us stroll up to this cute little cart and order these pastries. It was very rare that we ever bought food while we were out, that was normally saved for special occasions only. But I guess we were just having fun. Good old, cheesy mother daughter time. Neither mom nor I knew what beignets were. This was before I hade begun to explore my “culinary abilities” and the families diet was chicken with rice, pasta and some more chicken and rice. I remember it so clearly. We were sitting at this round table that seats two, with lights strung above us. You kind of felt like you could be in Paris at that moment, it was cozy. We were plotting on how to move the whole family, all nine of us out to Colorado. My mom and I were the driving forces on this move and we were determined! However, we seemed to be able to take a break from our mischievous plotting to inhale the doughy, sugary things that they called beignets. 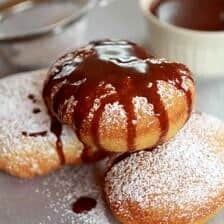 I can vividly remember my mom’s face, it was pure happiness and there was not even any chocolate inside those beignets. So when I was thinking about her birthday the other day, I remembered this day. Not sure why, but I did. I think it’s probably because it is such a happy memory of mine. I was young, care free, and enjoying the day with mom. Oh, and eating beignets! The perfect day. I of course had to step them up a notch and add chocolate…….in the middle and on top. And not just any chocolate. The filing is chocolate hazelnut spread and the sauce is a chocolate hazelnut sauce. I mean it is her birthday, I can’t disappoint. Dare I say better than cake? Mix the yeast, sugar and water in a large mixer* bowl. Let sit for 10 minutes. *Note: You don’t need a stand mixer to make this recipe, but it will make things easier. Start with the standard paddle hook, but you’ll need the dough hook later. In another bowl, beat together eggs, salt and evaporated milk. Pour egg mixture into the yeast mixture and stir well. Add 3 cups of flour and mix on low or stir until combined. Add shortening or butter and continue adding the remaining 4 cups of flour slowly until it’s all incorporated. Dough will be sticky. At this point you can switch your mixer to the dough hook and beat on medium, adding more flour about a tablespoon at a time until the dough pulls away from the sides and forms a smooth ball (about 4-6 minutes). If you don’t have a mixer or would rather knead, place the dough on a floured surface and knead until smooth, adding a little more flour as needed (about 8-10 minutes). The dough may still be a bit sticky, but shouldn’t be overly so. Spray a bowl with cooking spray and place the dough inside. If the bowl doesn’t have a cover, lightly place some plastic wrap on top. Let rise for 2 hours in a warm spot. I like to turn my oven on to the lowest temperature for about a minute and then immediately turn it off again. Then I place the bowl in the warm oven. 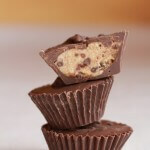 In a microwave safe bowl, mix together butter, chocolate, and milk. Microwave in 30 seconds intervals, string until all the chocolate and butter is melted and the mixture is smooth. Store in the fridge or let sit out until beignets are ready. Warm it back up on the stove or in the microwave. When the dough is ready place the dough on a lightly floured surface and roll out into a square or rectangle. Roll to 1/8 inch thick. Use a knife or pastry cutter to cut into 3×3 inch squares (about 50 squares). place a deep pot like a dutch oven on the stove and add enough oil to fill the pot about 1 to 1 1/2 inches deep. Turn the burner to medium and preheat to 350 degrees. I would recommend using an instant read thermometer so you know the exact temperature at all times. It will take about 10-15 minutes to heat up. If you don’t have a thermometer, you’ll know it’s ready when you sprinkle some flour in the pot and it sizzles. If it gets hotter than 350 or starts smoking, remove the pot from burner immediately and let it cool down to the correct temperature. Set several layers of paper towels near your pot. Fill a paper or plastic bag with powdered sugar and place that near the paper towels. When the dough is cut and the oil is at the correct temperature, add a dough square, one a time, to the pot with a slotted spoon. Fry 4-6 at time depending on the size of your pot. Be careful: if you add too many at once or you may wind up burning them. Use the slotted spoon to flip them over every 30 seconds. Fry for 2-3 minutes or until golden brown on both sides. If they are taking longer than 3 minutes to brown you need to turn your burner up and make sure your oil is at the correct temperature. Remove with slotted spoon and place on paper towels to drain. Let cool for a minute and then transfer to the bag of sugar. Hold the bag closed and toss to coat. Repeat with remaining squares. 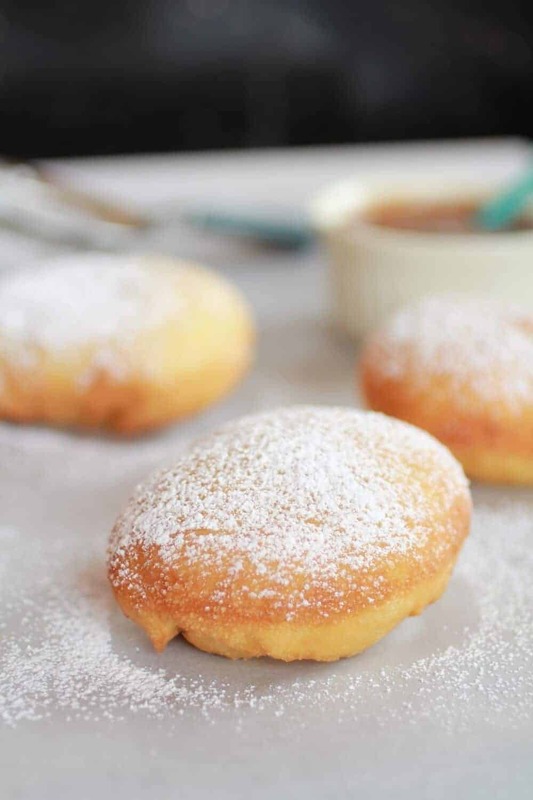 *Beignets are best when they’re still warm, but they’re still good at room temperature. They’re also best the day you make them, but can be stored in a sealed plastic bag and eaten later. The dipping sauce is best served warm, but it’s not bad chilled either. It should be stored in the fridge. *you can start making these the night before. Just do everything up to rolling out and cutting up the dough. Place the squares on a parchment-lined baking sheet and cover with plastic wrap. Place in the fridge overnight. Take them out in the morning and let come to room temperature while the oil heats up. Then proceed with heating the oil and frying them. You could also freeze the squares and take out a few at a time whenever you want. 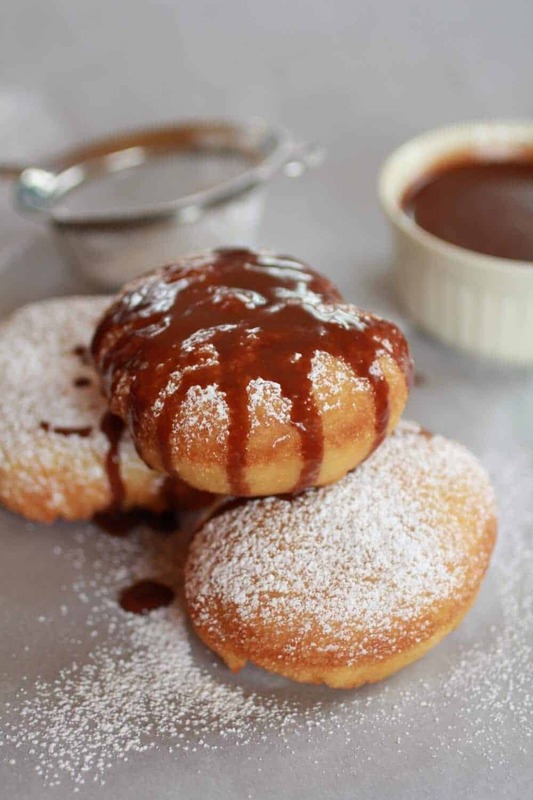 I mean……Chocolate Beignets! I think…YES! I remember that place at Crocker Park! It’s hard to find these desserts (unless you are in New Orleans which is where I first had them. Cafe Du Monde? Or something like that.). Great pick for your Mom’s bday. 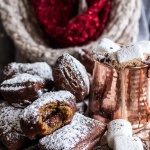 Chocolate and bread! 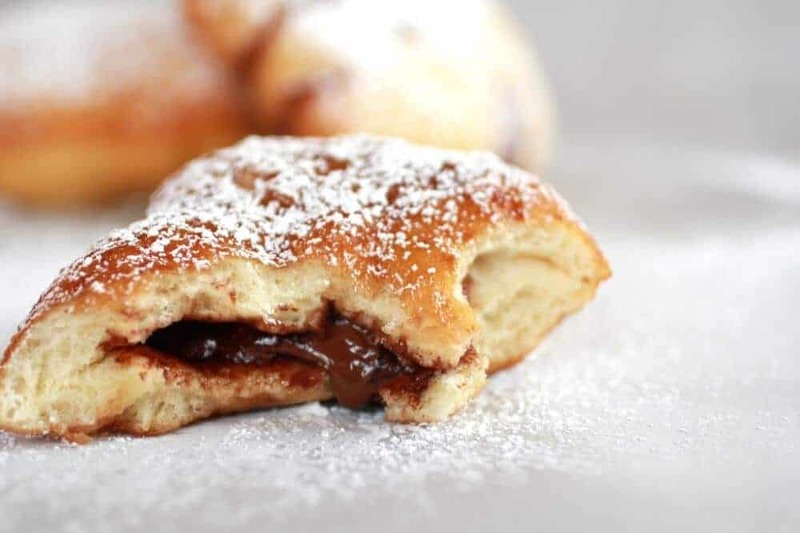 I love beignets and these look delicious with the chocolate hazelnut sauce! What a special memory with these pastries… your mom is very lucky to have a daughter who would make such a wonderful treat on her birthday. Oh my heck! Absolutely amazing!!!! I bet your Mom loved them! Wow! These look amazing! I bet your mom loved them. Thanks for sharing. When I was there last summer the chess board was there. In fact it was quite the gathering place. Thanks for reading! 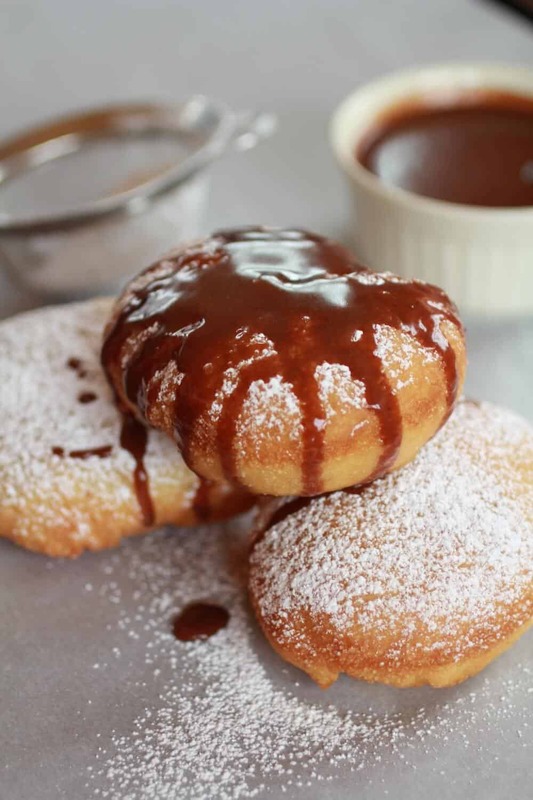 Mmm…Beignets make me think of New Orleans (I have family there). 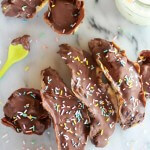 I’m pinning this recipe to make the next time we’re craving a little bit of New Orleans! These look delicious! I love doughnuts and the like, and almost never make them, but maybe you’ve just inspired me. Yum!! 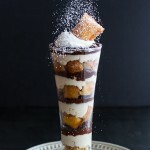 Hi, I’m visiting from Think Pink Sundays and this looks delicious! I might just have to try a gluten free version. Thanks for sharing! Let me know how the gluten free version turns out! Thanks for reading! Bye-bye diet! Hello chocolaty goodness! I am a new follower! I found your link on Flamingo Toes. I would love for you to link up to my weekly linky party Fluster Muster on Wednesday’s @ http://www.FlusterBuster.com. 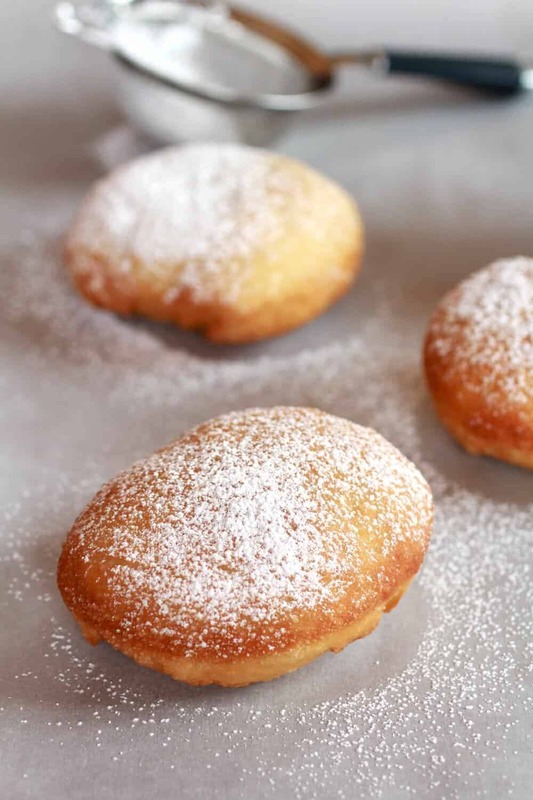 Love this recipe … so funny on the timing … we were just planning our Super Bowl menu and decided to have beignets (my son-in-law’s idea) for dessert! This is receipe I am going to use!! Perfect!! Thanks again!! Seriously I am coming over to your house so you can cook for me! I love Beignets! Thanks so much for Linking up at Show Me Your Plaid Monday’s! Anytime! Everybody else just seems to wind up here anyway! These look uh-mazing! I so want to make them! Thanks for sharing! Seriously, thee are a must make! So goood! Oh my goodness, these look amazing! I’ve just started my new year’s diet so I may have to wait a while before trying them but have pinned for future! Thanks for pinning! Everyone needs a little treat right?!? These are perfect! Found you on the pinning party! New follower on Twitter & will be pinning these! MY daughter would LOVE these. Totally pinned and waiting to be made!! I am so glad you shared this on Manic Monday!! Oh yum. Have to give this a try. Sounds like an amazing mom! And an amazing recipe! Your mom sounds a lot like mine – six kids and at any given time, at least half a dozen “extras” that spent most of their time at our house for one reason or another. Makes life really interesting! thanks so much for sharing on Busy Monday! Holy Cow!! This looks amazing! Thank you for sharing at All My Bloggy Friends last week! Pinned, shared on Facebook, and will be featuring tonight 🙂 They look amazing! Thanks so much for pinning, sharing on facebook and featuring them! I am so excited! You are absolutely making me drool over these! And that sauce and deep-fried goodness is simply wow. YES! i love making people drool!